Fine Arts Chamber Players invites you to a FREE Bancroft Family Concert on Saturday, January 31, 2015 at the Dallas Museum of Art (DMA). French music for strings and piano complements the DMA’s exhibit Bouquets: French Still-Life Painting from Chardin to Matisse, a collection of 68 floral paintings from artists in France surrounding the 19th century. Horchow Auditorium doors open at 2:30pm for the 3:00pm concert. The museum is located at 1717 North Harwood, Dallas, TX 75201. Admission to the concert is free with no reservations or tickets required. For more information, please call 214.520.2219 or visit www.fineartschamberplayers.org. 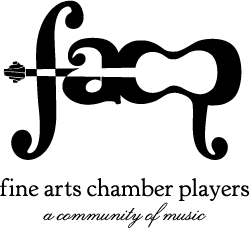 Outstanding area professional musicians present a program highlighting Cesar Franck’s most revered chamber work, Quintet in F minor. Revitalizing 19th century French instrumental music, Franck penned the quintet for strings and piano in 1878-1879. The 35-minute piece is paired with Beethoven’s charming Serenade in D Major, Op.8. Musicians include members of the Dallas and Fort Worth Symphonies: violinist Aleksandr Snytkin, violinist Ordabek Duissen, cellist Nan Zhang and Sergey Tsoy, viola and 2nd prize winner of the 2007 International Violin Competition of Sion-Valais (Switzerland) with pianist Andrey Ponochevny, international soloist and Bronze Medal Winner of the 2002 Tchaikovsky International Competition in Moscow, Russia. Bouquets: French Still-Life Painting from Chardin to Matisse requires a special exhibition ticket and is open through February 8, 2015. More information is available at www.dma.org. Bancroft Family Concerts are made possible in part by the Sue & Christopher Bancroft Family, Dallas Museum of Art, Union Pacific Foundation, City of Dallas Office of Cultural Affairs, TACA, Texas Commission on the Arts, National Endowment for the Arts and Sloan Bergmann Print Services. For over 35 years, FACP has presented free classical music programs for the enrichment of North Texas area residents. In addition to the free Bancroft Family Concerts, FACP presents the free Basically Beethoven Festival in July. Each year, FACP’s educational outreach programs: Dream Collectors, Music A to Z, residencies and masterclasses, provide over 500 free educational classes and performances in area public schools. Since its inception in 1981, FACP has served over 210,000 children and performed for over a half-million residents of North Texas.